Lately, I have been hanging out on the restaurants in the Metro. Yes! That's why I gained a lot of weight and I am so discourage to post an OOTD. Hahaha For now, I think I will post more of food and movie reviews. Hmm.. Well, it depends on my mood. Haha Today, I am craving for Japanese food, everytime my mom wants to go Japanese, this is one of our to go restaurant. 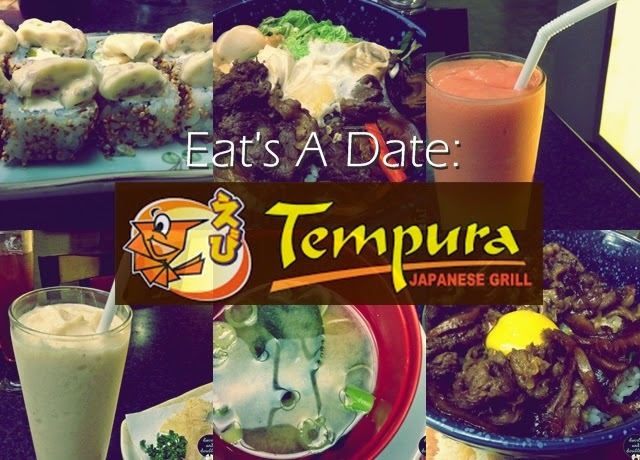 The... Drumroll please... Tempura Japanese Grill. Uncle Sam's Maki is one of their original maki. It really tastes good. It has a unique flavor. Nutty banana shake - anything that has a banana on a shake will defininitly be safe on our taste buds. Miso soup - this is one of the soups that will always be on a japanese restaurants. It is healthy. I read somewhere that it can help cure cancer because of the nutrients that a miso can give to our body. Four season shake - it is consist of mango and other fruits hahaha try it! Gyudon - This is my usual order to a japanese restaurant. Sometimes I feel incomplete without ordering this dish. It is a rice toppings with beef and raw eggs.